March here in Portland means one of my favorite things – it’s time for Portland Dining Month! 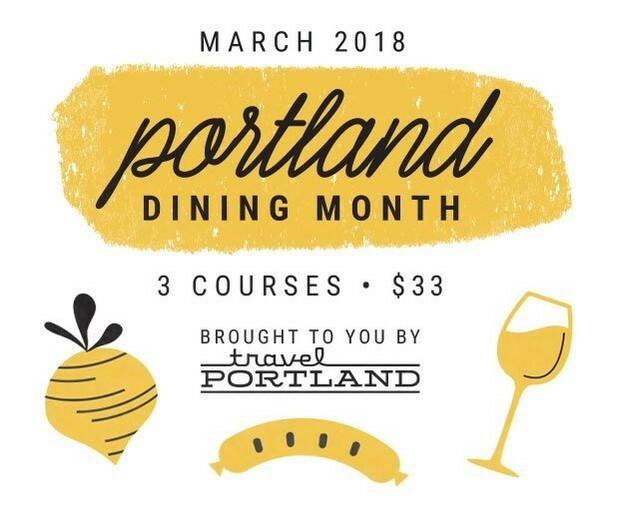 In case you’re not familiar, Portland Dining Month gives diners the chance to eat a three-course meal at restaurants across the city for only $33. Which is a major bargain considering what a meal at some of the restaurants on the list would normally cost you. It’s a perfect excuse for a date night and a great way to try out a new restaurant or two that would be a much bigger splurge 11 other months out of the year. You can see all the menus of the participating restaurants online here and you also have the ability to make reservations at many of the participating restaurants. And what’s even more awesome is that if you do make a reservation online via Open Table, a donation will actually be made to the Oregon Food Bank to help fight hunger. Andina – I’ve been to this Peruvian restaurant in the Pearl District a few times and I’ve never been disappointed. Even though there are lots of restaurants on the Portland Dining Month list that have opened more recently, I feel like Andina is just so consistently excellent that it’s one not to be missed if you haven’t been. It’s also the kind of place where their menu can be slightly overwhelming, so another nice thing about dining there during Portland Dining Month is that your options are already narrowed down for you to a few great choices. Aviary – This place is on my list for two reasons. One, it’s a restaurant in Portland I’ve heard good things about, but have never tried. And two, their Portland Dining Month menu looks particularly tasty, especially that short rib! Bistro Agnes – This French restaurant is one of 2018’s most anticipated Portland restaurant openings by two James Beard award-winning chefs, and Portland Dining Month would be the perfect time to check it out! Burrasca – This charming Italian restaurant is in my neighborhood, but I’ve only once and I’ve really been wanting to try it again. They make authentic Italian dishes and their pasta entree on the Portland Dining Month menu sounds really fantastic. Tagliatelle alla norcina: spinach ribbon pasta with house fennel sausage, leeks, light béchamel and Parmigiano-Reggiano. Jack Rabbit – I have yet to try this restaurant from celebrity chef Chris Cosentino, but it’s been on my list to check out for awhile now. And that lemon tartlet sounds pretty divine! Laurelhurst Market – Cameron and I went here for our anniversary this year and it’s one of my favorite Portland spots for a consistently delicious meal. Plus, that beef gnocchi sounds ridiculously good. Little Bird – I haven’t been to this restaurant in awhile, but it’s such a charming spot downtown where the food is always delicious. I also like that they give you options for each course, so that way you and your date have the option of trying different things! Paley’s Place – This restaurant is somewhat of a Portland institution yet it’s one that that I somehow have yet to try. I’ve always wanted to eat here and March would be an ideal time, especially since a three course meal here would normally run you much more than $33. Woodsman’s Tavern – This restaurant is a favorite of mine thanks to it’s rustic but refined ambiance and its consistently good food. It seems to have a renewed energy now that Chef Doug Adams has taken over the kitchen, so if you haven’t checked it out yet, this would definitely be one to add to your list. Xico – This is another restaurant that I’ve only been to once (even though it’s in my neighborhood) but I really need to change that this month! They serve up amazing flavors and their Portland Dining month menu looks delicious. Xico, Salt & Straw & Woodblock banana split:A collaboration between Xico, Woodblock Chocolate and Salt & Straw. Ice cream featuring Mexican Fernet, Woodblock chocolate & mole spices, served with caramelized bananas and dulce de leche. It was really hard to narrow it down to these ten because there are so many amazing options on the list that you really can’t go wrong! Finally, I am giving away dinner for two at Woodsman’s Tavern during Portland Dining Month today over on my Instagram, so hop on over there to check it out! Happy dining! Andina is high on my list for PDM too! !